First off, I apologize for only posting playlists and self-promotional entries lately. I promise to get back into a more regular blogging schedule soon. I’ve already been making some changes in my life to make that easier to do, which I’ll post about soon. 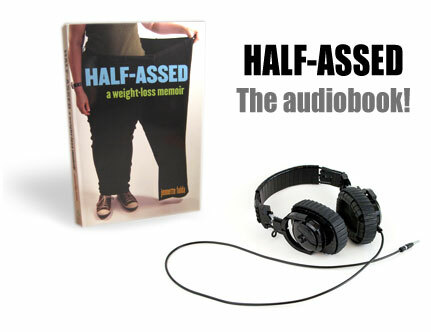 That said, my publisher would probably appreciate if I mentioned that the audiobook for “Half-Assed: A Weight-Loss Memoir” is now available to purchase on Audible.com. It’s read by Teri Clark Linden and it’s a great way to spend 8 hours and 22 minutes. Listen to it on the treadmill for inspiration! Ok, end of promo. More blogging to resume soon. 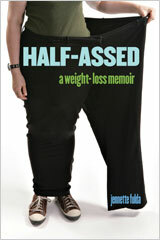 Good book but why don’t you talk about what you did to lose weight? Is it a secret?? @curchek – I did the South Beach Diet. If you poke around pastaqueen.com I blog about it several times during my weight-loss process. 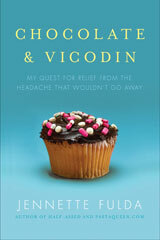 I didn’t mention it in the book because 1) I didn’t want to appear to be a shill for a certain diet and 2) I believe there are lots of different diet plans that can result in healthy weight loss and didn’t want to make it seem like there was only one true diet you could follow to get results. I am enjoying your audiobook, however I wish I would have purchased the actual book instead. I feel much of your humor doesn’t come across as intended. It sounds like it is read by a computer. Wish you would have recorded it yourself!! Unfortunately, i have to agree with Terri (above).